Some states have parent-centered associations affiliated with NAGC, and some districts have local gifted parent groups, but few offer information for parents of gifted LGBTQ students. Parents may experience feelings of isolation similar to that of their children and may wonder what their rights are, what they can do to support their children, and what parents and advocates have done in the past that will provide a basis for action. Parents should be aware that NAGC recommends that educators demonstrate compassionate understanding of these students and support them in maximizing their potential. (Keener, 2013; NAGC, 2015; Sedillo, 2013; Treat, 2008, 2016). Interventions are necessary to support unique psychosocial needs of gifted LGBTQ students as well as the academic needs (Friedrichs, 2012; Peterson & Rischar, 2000; Treat, 2016; Whittenburg & Treat, 2009). Administrators, teachers, and counselors require specific, ongoing professional development to understand the needs of Gifted LGBTQ students (NAGC, 2015; Sedillo, 2013; Whittenburg & Treat, 2009). Having this toolbox available will afford parents the opportunity to become familiar with resources similar to those used by educators and administrators, helping to level the playing field in parental advocacy efforts. One of the most important and rewarding activities in which parents and other family members of gifted LGBTQ youth can engage is networking in the community. 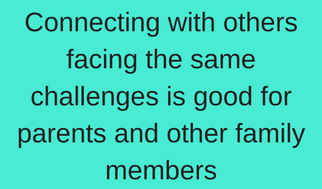 Connecting with others who are facing the same challenges can provide much-needed support, offer suggestions, and advice (Friedrichs, Manzella, & Seney, 2017). Parents and guardians may inquire at school about opportunities for connecting with other families of gifted LGBTQ students, perhaps through a gay-straight alliance, if one is available. Parents of gifted youth often find themselves spending a lot of time advocating at school—or opting to pursue a homeschooling alternative—to ensure that their children get the appropriate levels of academic challenge and pace necessary to keep them engaged, in order to develop lifelong learners (Davidson & Davidson, 2004). When a student is also a member of a gender or a sexual minority, the scope of that effort expands. In many cases (as indicated by the GLSEN statistics referenced earlier), assuring a student’s safety in the school setting requires its own advocacy work. Not every lesson in every subject will need (or be able) to encompass all facets of the student’s identity. Parents should involve teachers and mentors who will acknowledge and affirm the whole child. In doing so, they can support—not only the child’s intellectual abilities, but also the teen’s emerging adult identity. If parents/guardians do not provide this kind of support, gifted LGBTQ youth may struggle with self-esteem issues and question whether their parents accept them unconditionally (Brown, 1997; Friedrichs, Manzella, & Seney, 2017). Gifted LGBTQ students benefit from seeing themselves in positive role models, as represented in the curriculum (Whittenburg & Treat, 2009). The sexual orientation or gender identity of eminent leaders in various fields, such as Alexander the Great, Susan B. Anthony, James Baldwin, Colonel Margarethe Cammermeyer, George Washington Carver, Leonardo daVinci, James I of England, Sir John Gielgud, Barbara Jordan, Frida Kahlo, Audre Lorde, Michelangelo, Bayard Rustin, Bessie Smith, Socrates, Gertrude Stein, Alan Turing, Walt Whitman, Oscar Wilde, and Tennessee Williams, amongst others, are omitted, especially in elementary and middle school curricula. What is assumed is heterosexuality. The omission of their orientation or gender identity implies that these groups have less value, importance, and significance in our society and leaves gifted LGBTQ students without positive role models except perhaps in the media. Even if the sexual orientation or gender identity of famous individuals are absent in the curriculum, revealing their orientation to gifted LGBTQ children would help him/her understand that others like them have made great achievements. Learning about renowned LGBTQ individuals can bolster their self esteem and increase confidence (NAGC, 2015). There are several books and websites available that can help parents and guardians identify notable LGBTQ persons. Respect a child’s privacy. Just because a parent knows their child is LGBTQ, does not mean this is a license to tell others (Keener, 2013). Check with the child in private first before revealing information that could result in harassment or lack of acceptance. Be patient about grades. Many supportive families report a drop in grades both shortly before and after their children begin the “coming out” process. Patience and understanding, combined with a loving message of acceptance may help him or her academic performance bounce back more quickly (Keener, 2013). A passion for social justice may result in wanting to promote LGBTQ causes, such as participating in a local Gay Pride community event (staffing a booth/table for an LGBTQ organization) or volunteering at a shelter for homeless LGBTQ youth. Please check with the child to see if he or she is ready for such public support (Keener, 2013). Parents are encouraged to explore the links in the resource section, to find more information for use in advocating and to deepen their own understanding of the challenges their child may face.